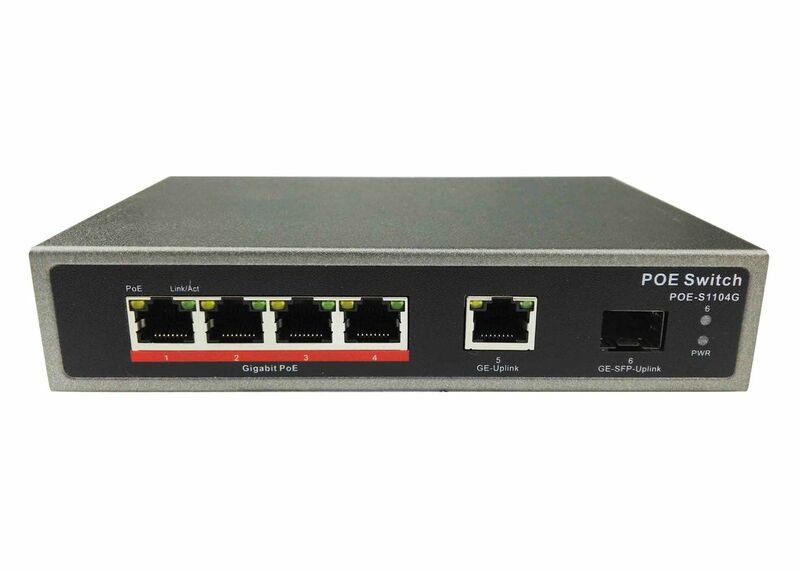 POE-S1104G is 4 port Gigabit Power over Ethernet switch with 1 port Gigabit RJ45 uplink and 1 port SFP fiber uplink, equipped with 65W external power supply and any one of these 4 ports supplies maximum 30W base on IEEE802.3af/at Ethernet protocol, and go through pins 1,2,4,5 "+", 3,6,7,8 "-" over Ethernet cable cat5 least or cat5e, cat 6, cat6e, cat7, etc. Meanwhile, it's highly practical and suitful for CCTV surveillance installed in household, office building, hospital, campus or else where require building a network systems such as VoIP Phone, Wireless Access Point, Access Control, Portable Device or even Intelligent LED Light System and other PoE compatible Powered Device (PD). 4 Gigabit POE + 1 Gigabit RJ45 Uplink + 1 Gigabit SFP Uplink. Compliance with IEEE 802.3af/at, 12G bandwidth. MAX 30W for every single port, total external input power amount 65W. 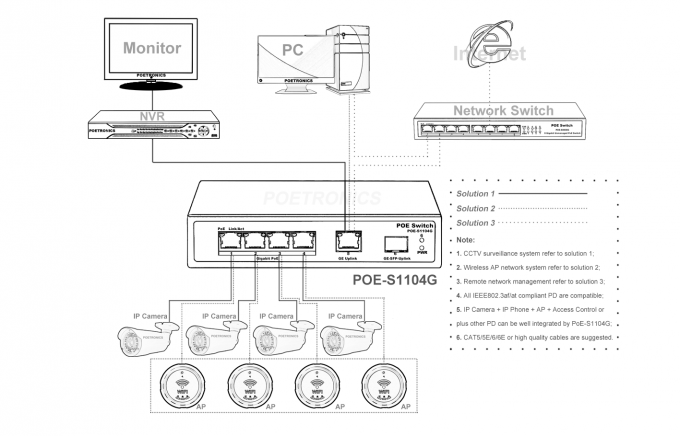 PoE working conditions can be read and analyzed through involved LED indicators on front panel.